Not only is Skyward Sword big, it's also the most immersive Zelda game ever made, says Nintendo. Legend of Zelda: Skyward Sword is Nintendo's biggest videogame project. That's according to Nintendo of America PR man David Young, in a video demonstration of some of the game's combat and equipment. "The great thing about Legend Of Zelda: Skyward Sword," he explained, "is that it's filled with content so as you're going through exploring dungeons from place to place you're going to find tons of different things to explore, see and collect." This isn't the first time that Nintendo has suggested that Skyward Sword is bursting at the seams with content either; Shigeru Miyamoto said that there was between 50 and 100 hours of gameplay in the game. 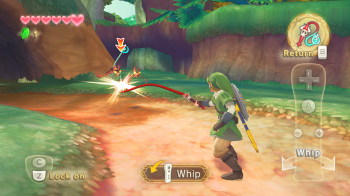 Young also said that Skyward Sword would be the most immersive Zelda game to date, thanks in no small part to the Motion Plus-powered controls. As I said when the news that Skyward Sword would have a full orchestral soundtrack, it seems like Nintendo is really pushing the boat out for this one. Of course, with the Wii U coming out next year, Skyward Sword could very well be the last high-profile first party release the Wii gets, almost making Skyward Sword the console's swan song.